Know what I want? For your awesome, heartfelt, inspiring business to succeed. That’s why I’ve created this collection of free resources, tools & tutorials to help elevate your hustle. Enjoy! I’m embarrassed to admit this, but I think it might help you so here goes... I used to save every single paper receipt, every single one, and manually add them- you got it, line by line- to a Google spreadsheet. I set out to do this monthly, but of course skipped some logging days along the way, and so a vicious cycle bloomed- the receipts would pile up, making the task of entering them in the spreadsheet a beastly chore that I evaded at every turn, thereby swelling the pile even more. Then, when April rolled around with tax day looming, I would spend hours upon hours hastily entering hundreds of receipts, always paranoid that I somehow lost track of some along the way. Once all the paper receipts were logged, I would search through my email for all my digital receipts and add those too. Next I would go through all my bank accounts and payment gateways and total up all my income. Then I would go through every single line item, categorizing each one according to expense type or income. Finally I would total each category in a separate tab and send that over to my tax preparer. This was my botched, backwards way of bookkeeping and it drove me bananas! And so I started researching free and low cost online accounting software platforms, one which had been following me around on my regular podcast rotation (you know who you are, FreshBooks). So I signed up for a few free trials to compare. I’ll spare you the long winded analysis and just tell you that my hands-down fave was QuickBooks Self-Employed. By a long shot. While the other QuickBooks plans have many more features for advanced accounting needs which is fabulous, QuickBooks Self Employed keeps it super simple for us small businesses and freelancers while still offering plenty pretty-sounding bells and whistles. It allows you to link all of your financial accounts (checking and savings, credit cards, PayPal, Venmo, Shopify, Square, etc.) so that each transaction is automatically funneled into your QuickBooks account, awaiting categorization as business/personal income/expense with a single click. Buh-bye paper receipts and spreadsheets! It’s been unreal! This automation and simplified categorization has saved me countless hours and headache, and darn if I don’t scream it from the rooftops! Type - business or personal, income or spending, uncategorized, transfers, etc. QuickBooks Self-Employed allows you to track mileage through the mobile app, seamlessly invoice clients, estimate your quarterly taxes, and snap photos of your receipts to link them to expenses right from your phone. You can even invite your accountant to collaborate with you for free. Once they accept your invitation, they can work directly in your account. You can delete their access anytime. The one downside to Self-Employed is that it does not upgrade to any other QuickBooks plan. However, if you do decide to upgrade to something like QuickBooks Intuit down the line, all you would need to do is export your financial history into a CSV file and upload that to your new QuickBooks account, then simply re-link your financial accounts. Easy. Now here’s the best part- Quickbooks Self-Employed is only $10/month!!! Literally less than a cup of coffee and a sandwich (which is pretty sad but let’s not focus on that right now). IMO QuickBooks is the best accounting software for small businesses and freelancers because it offers more features than most and at a competitive price, plus most every accountant and tax professional already uses the platform. I haven’t found a single part of the software lacking, and feel like I’m lightyears past my accounting woes of 2018. It’s so incredibly important for us self-employed folk with the never-ending to-do lists to be able to cross off financial organization. I hope this brings some ease and lightness into your life, especially around stressful tax season! 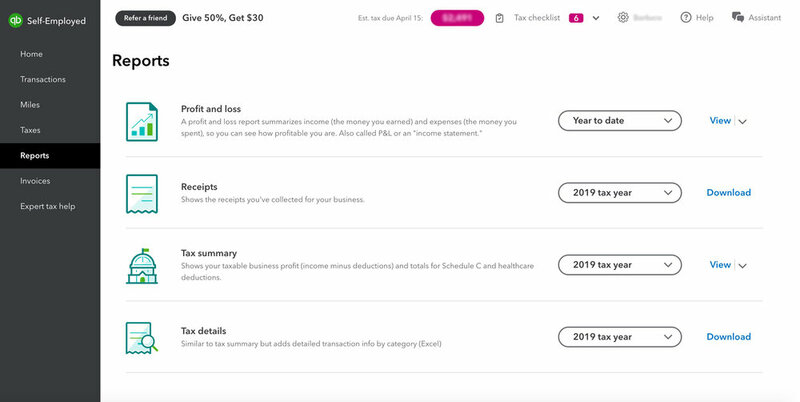 To sign up for your shiny new Quickbooks Self-Employed account and get 50% OFF YOUR FIRST 6 MONTHS please use my affiliate link. You will NOT regret it!